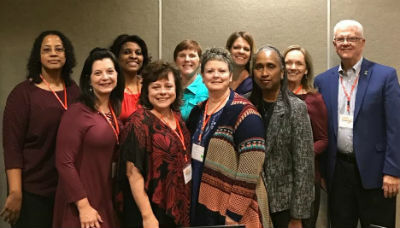 The Wesleyan Holiness Women Clergy (WHWC) organization held a “think tank” Congress on February 23–24, 2017, in Atlanta, Georgia. 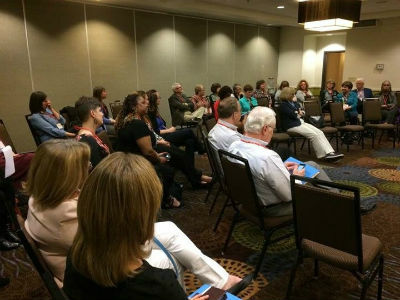 Forty representatives, both women and men, from five member-church groups, came together to discuss the state and mission of the twenty-five-year-old organization. The Congress welcomed representatives from the Church of God (Anderson), Brethren in Christ, Free Methodist Church, Church of the Nazarene, and the Wesleyan Church. These faith groups came together not only under the banner of Jesus, but also because they’ve each taken a stand in support for women in ministry. Rebecca New-Edson, director of Western Pennsylvania Ministries of the Church of God—and former chairperson of the Ministries Council—also rejoices in the cross-denominational effort for the cause of Christ. 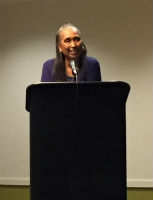 “I was encouraged by the flexibility and willingness in rethinking our purpose for being, acknowledging the prevalent needs for undergirding women in ministry, and considering working with other denominations—whether or not they are Wesleyan Holiness—to strengthen support for those women who are entering ministry.” Making a difference for women in ministry is simply too important to take a fractured approach. After all, Jesus is the subject, not which church name is over the door. Photo: Cheryl Sanders speaks at the event. Still, working across denominations isn’t the major challenge facing the Wesleyan Holiness Women Clergy. “I enjoyed the critical thinking that took place as we looked at the challenges and worked on addressing those challenges,” Rebecca explains. One of the great hurdles to cross is ensuring leadership development among women who sense the diving call. Another challenge, as she puts it, is “enlisting ministers who are men to honestly consider and welcome women as equal coworkers as they lead according to God’s gifting.” The WHWC Congress served as a strategic visioning experience to consider the best ways to meet these and other challenges in the most effective ways possible. With input from each focus group, WHWC president, Dr. Mari Gonlag and Dr. Jo Anne Lyon (the Wesleyan Church) summarized the Congress’ reflections. Rev. Linda Adams (Free Methodist) and Bishop Perry Engle (Brethren in Christ) also gave summary comments. The Congress gave resounding support for the continuation of the organization, affirming the importance of WHWC as a prophetic voice to impact God’s kingdom through networking/mentoring, advocacy work for women clergy, and broadening funding streams. The WHWC Board and Planning Committee met for additional days to continue planning for the next WHWC Conference. The Church of God is represented on the WHWC Board by Carron Odokara, and on the WHWC Planning Committee by Deidra Johnson. The 2018 WHWC Conference is scheduled for April 12–15, 2018, at the YMCA of the Rockies in Estes Park, Colorado. Make plans now to be there! This entry was posted in All Church of God, Southeast and tagged Atlanta, Carron Odokara, congress, cross-denominational, Deidra Johnson, ecumenical, Georgia, Global Wesleyan Alliance, Jesus Is the Subject, Jo Anne Lyon, Joy Sherman, Rebecca New-Edson, Wesleyan Holiness Women Clergy, WHWC, women in ministry. Bookmark the permalink.